The Rovectin Skin Essentials Conditioning Cleanser claims to be a gentle, low-pH, hydrating cleanser which washes away daily grime without stripping skin of its protective moisture barrier. A foaming cleanser comprises surfactants, the ingredients that create a lather/foam and deliver the cleansing properties to the product. This one includes several, all deemed gentle. Decyl Glucoside is a natural substance obtained from a combination of plant based fatty alcohols and glucose that does not dry the skin. Although the name might not suggest it, Disodium Laureth Sulfosuccinate is a gentle surfactant and not considered a harsh sulfate. Not to be confused with Sodium Lauryl Sulfate (SLS), Sodium Lauryl Sulfoacetate (SLSA) is naturally derived from coconut and palm oils and is responsible for a rich lather without skin irritation. It is a natural cleanser that is hydrophilic so dissolves and rinses quickly and gently. 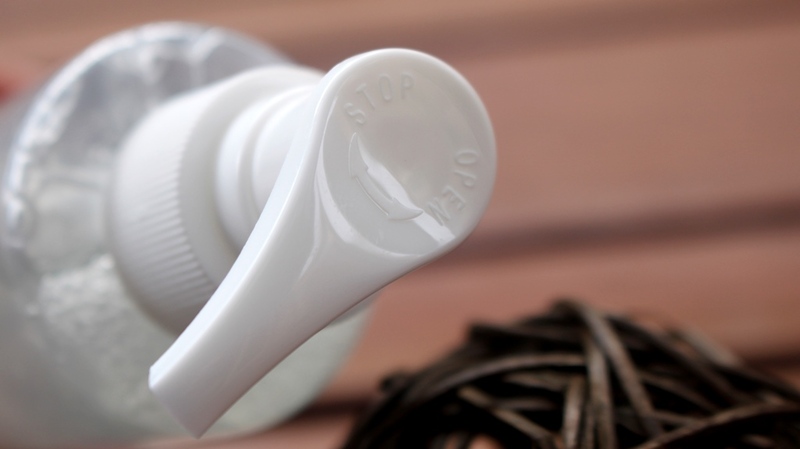 Sodium Cocoamphoacetate, Sodium Cocoyl Glutamate and Disodium Cocoyl Glutamate are coconut derived surfactants which offer a gentle cleansing effect, the first also enhancing product smoothness by improving slip. They allow water to mix with oil and dirt for effective rinsing away of impurities. Furthermore, Sodium Cocoamphoacetate helps to adjust the pH of the formula to achieve an optimum acidity. Balancing all the cleansing components is a solid dose of Glycerin, a popular humectant that draws moisture from the atmosphere into the skin. Improved hydration means glycerine helps skin look healthier by reducing dryness. It can also have an emollient effect, returning smoothness and softness to the surface. Citric Acid is an AHA and can also act as a gentle exfoliant, pH adjuster and natural preservative. Other ingredients are included for their ability to emulsify and thicken the product as well as adjust product acidity and extend shelf life. The Rovectin Skin Essentials Conditioning Cleanser is presented in a clear plastic bottle with a pump action dispenser that features open/close function. There is no outer package, rather the product delivered in protective cling plastic to prevent involuntary release/spillage. An ideal assessment is returned from both the CosDNA and EWG databases, rating the cleanser an ideal low hazard with absolutely no warning flags. Use as a second step cleanser, not for makeup removal. Use 2-3 pumps and lather between your palms. Massage the micro foam on your face and rinse with lukewarm water. 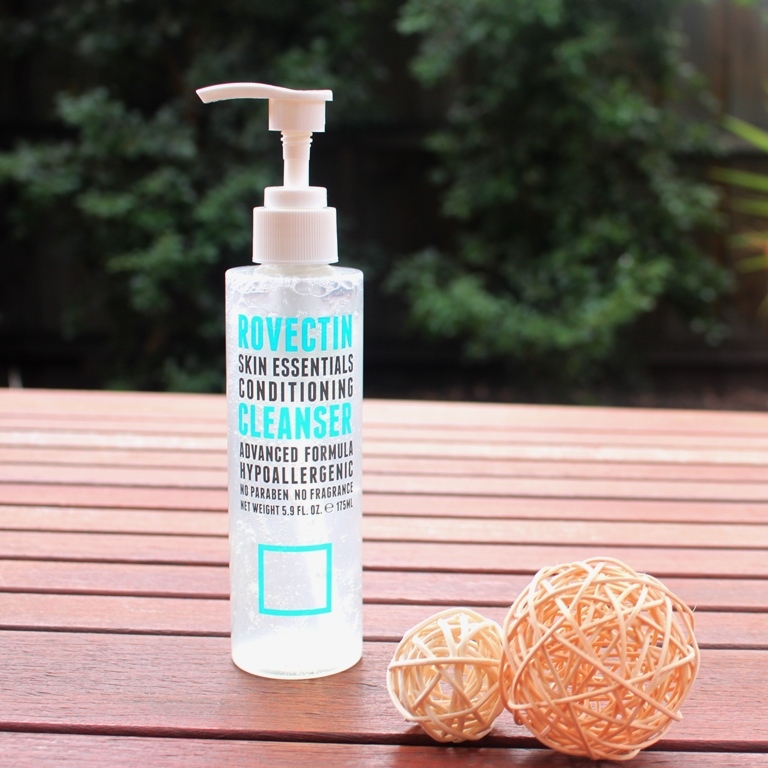 This Rovectin Skin Essentials Conditioning Cleanser has a mild coconut scent. 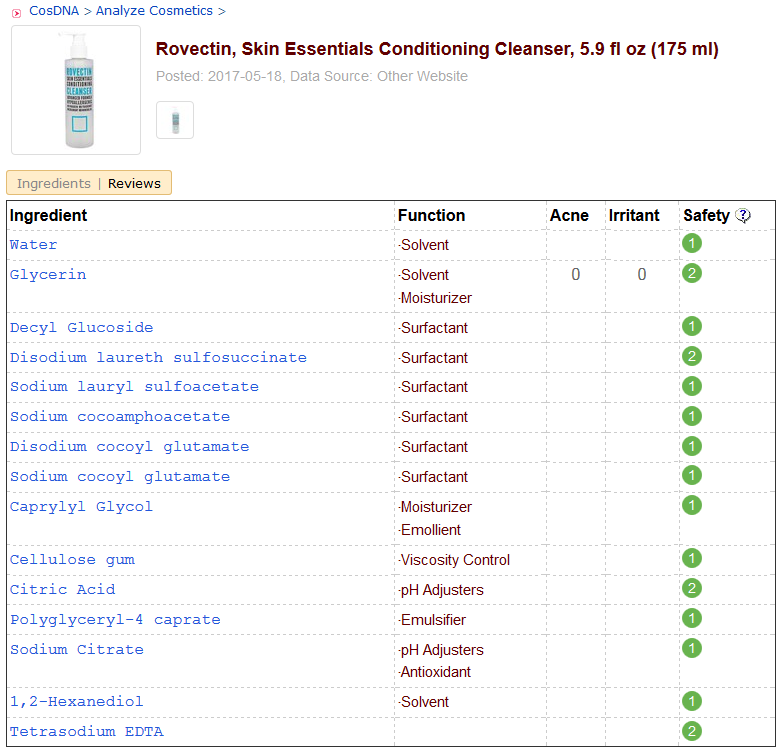 A 175ml bottle of the Rovectin Skin Essentials Conditioning Cleanser sells for around US$18 at Style Korean. 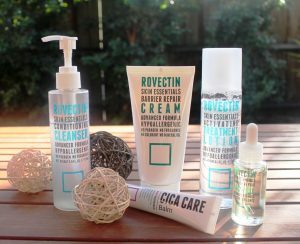 Rovectin products are available at beauty and skincare boutiques including iHerb. I received mine from Style Korean. The cleanser should be used within 12 months of opening. This bottle had an expiry of October 2020, indicating a shelf life of more than 2 years (likely 3). The Rovectin Skin Essentials Conditioning Cleanser is presented and labelled like all the other products in the brand’s range, assuring consistency and hence easy identification. The cylindrical bottle is sufficiently transparent so the product within can be easily viewed. The pump action dispenser allows the ideal measure to be released per cleanse. 1-2 full pumps is sufficient to effectively clean face and neck. Personally, I don’t like the twist locking action on pumps such as this as they tend to be messy and you lose product unnecessarily. Nonetheless, I don’t travel with this cleanser so keeping it unlocked/open on the bathroom counter or in the shower is fine. Since it is quite a tall bottle, I am more likely to siphon some into a travel container if I was to use it on the go. 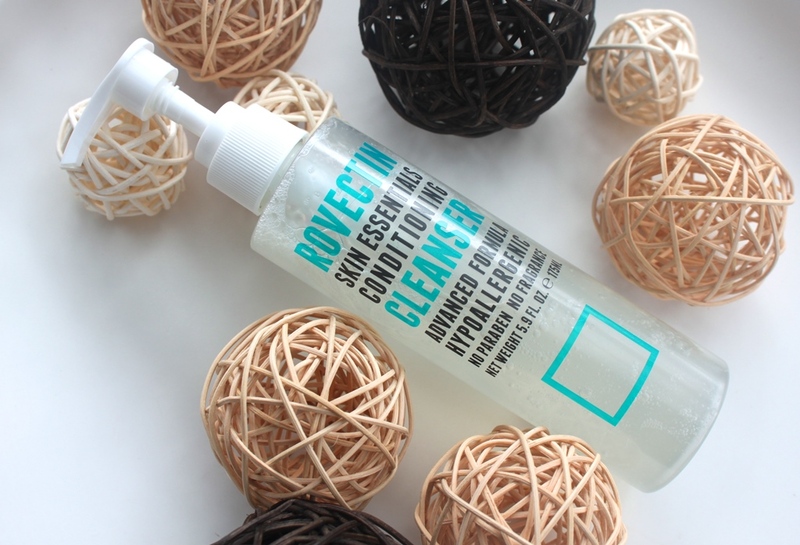 The cleanser has a clear, gel like viscosity. The scent resembles coconut, largely due to the high concentration of surfactants primarily derived from this fruit. There is no added fragrance. The scent is light and I hardly notice it upon application. To use, I drop the product onto my palms and then onto a damp face and massage in circular motions, like I would with any other gel cleanser. The lather is gentle and very light, Rovectin calling it a micro foam. This is quite accurate as typical fluffy foam does not form at all, even after a minute or two of rubbing. However, foam is not an indicator of cleansing efficacy although it does provide a visual and sensory satisfaction I have come to expect from such a product. The micro foam has a creamy texture and nonetheless provides a visual confirmation that the product is working. After the cleaning process is complete, the foam residue easily rinses off with cold or warm water. Once the face is fully dried, the effect of the cleanser can be assessed. From the first time I used this conditioning cleanser, I loved the results. Indeed, it does not dry out the skin, this confirmed by an ideal pH of 5.5. My face feels and looks clean and is also soft and smooth to touch. So indeed it fulfils its claims which are to perform an effective and hydrating clean without stripping the protective moisture barrier. There are no anti-ageing, acne controlling or pore detoxification claims that cleansers often promise which is refreshing. I quite enjoy products that do one thing but do it well. It is after all a wash off product which are generally not on the skin long enough to provide certain benefits. 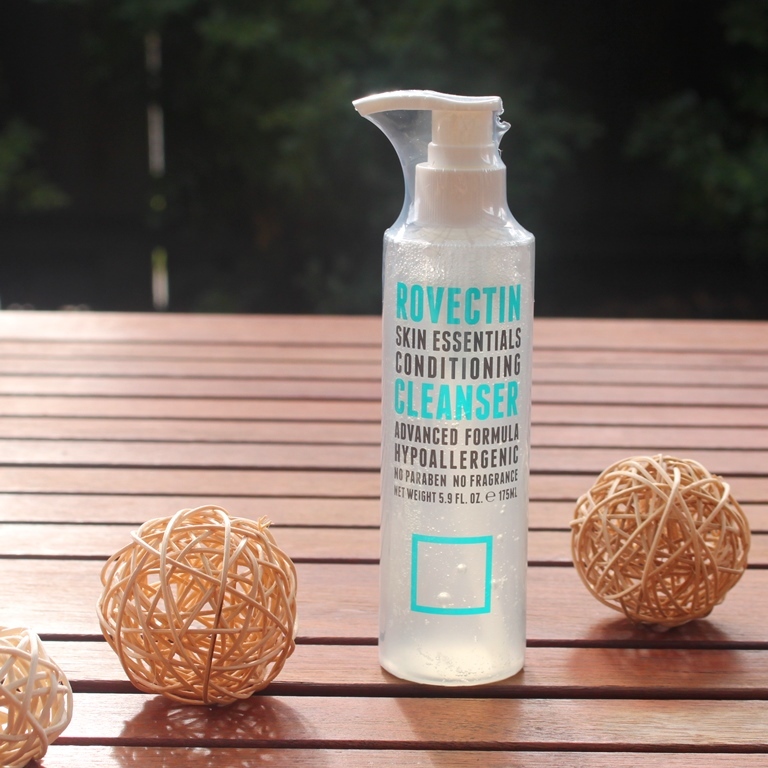 The Rovectin Skin Essentials Conditioning Cleanser simply delivers an efficient clean and that is all. Rovectin products are formulated to sooth and revitalize even sensitive skin. This Conditioning Cleanser certainly conforms by cleaning skin well without drying or stripping the protective moisture barrier. I have combination skin and find this effective and comfortable. I think it will suit all skin types and have no hesitation giving it a solid recommendation.